There’s much more to Warendorf‘s Hidden Kitchen than meets the eye! Ideal for open concept homes and modern lofts, this cool kitchen has a lounge vibe that blends beautifully with your living areas, tucking all your culinary essentials behind a fabulous feature wall. With the push of a button, the 7-meter panel folds open to expose a fully equipped culinary center complete with prep areas, sink, appliances, storage space, shelving, a hood fan and integrated lighting, all artfully concealed yet conveniently at hand. 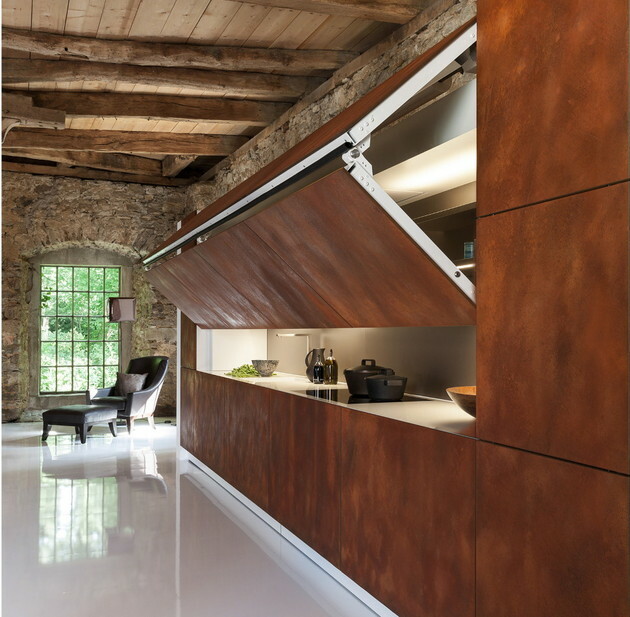 The facade features a sprayed rust finish that is warm and earthy – just as a good kitchen should be! And this kitchen is sure to become the hub of your home, whether hidden away or in full view. Check out the Hidden Kitchen by visiting Warendorf.